…and get a better idea with a closeup. I usually warp for 3 scarves, but this time I just did 2…I had no idea how this novelty yarn would work. 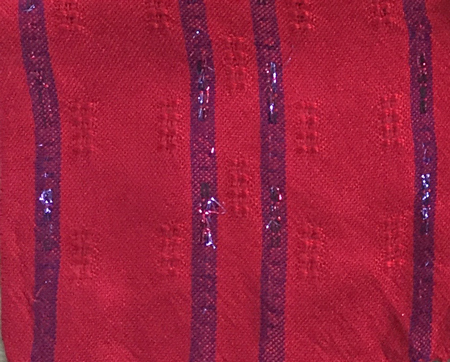 Would its metallic ‘hairs’ be completely caught in the warp and weft and not show? Would they stick out too much? Would it shrink at a rate much different from the rayon and pull it out of shape? As it turned out, it worked rather well. I have 2 balls of the novelty yarn and will use it again in the future. After I got these scarves done and recorded in my spreadsheet, I gathered my courage and looked at the number of pieces I’ve finished since July. I’ve spent a bunch of time not weaving due to other commitments, injuries, and a choice to make some time-consuming garments, so was afraid what these numbers would look like. As a reminder, my estimates are that I have to complete 6-7 quality pieces each month. So for July through March I should have finished 54-63 pieces. I was pleased with my total of 46. Although that’s between 8 and 17 pieces short, I thought it would be worse than that. Do I think I can make up 17? Probably not. But I think I can make up 8 in the next 3 months. Especially since I’ve woven very few scarves so need more, and they take LOTS less time than bigger pieces. I’ll be putting a warp on for 3 silk scarves tomorrow for a strong start to April. The novelty yarn is very fun. It worked well with the tencel since that doesn’t shrink hardly at all. I adore the scarf. Especially the tinsel. 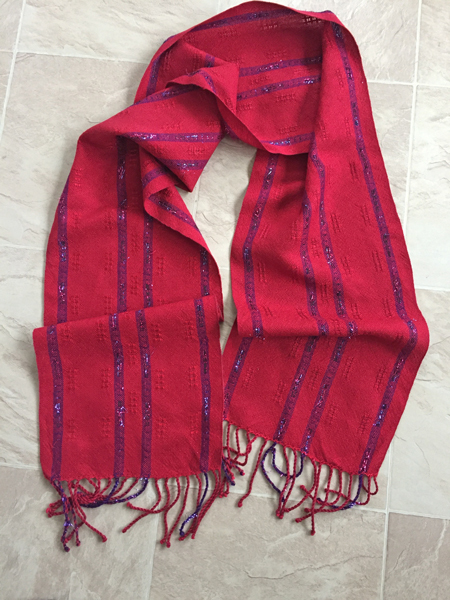 The red scarf is gorgeous, and should be snapped up quickly! Love the novelty yarn in that red scarf! Such fun.